If you're using Joomla and you're looking to add Geo Targeting to your ads, then look no more! Now iJoomla Ad Agency gives you the power and flexibility you need while remaining user-friendly to you and your advertisers. Geo-Targeting allows advertisers to display ads based on the geographic area of the viewer and helps to ensure that their ads are local, their products are reachable and the ad appears in the reader’s language.For example, a restaurant owner would only want to show his ads to people within his catchment area. Another plus is that an advertiser in Europe can create different ads for different countries, showing the right language based on the geo-targeting data. Some advertisers may also want to push a promotion for certain cities in conjunction with a local offline campaign. For example, if a Honda dealership in San Diego is having a special promotion, then they would want to target their ads to people in the San Diego area only. "When we presented this to the client and said "this is what we can do now" they were shocked. Every time you tell a sales person that they can sell the same space 4,5,10, 21 times over, that they they fall out of their chair, and really want to get on the phone and start moving the product"
Select the continent on which the ad will show (i.e. North America, South America, Europe, Asia, Africa, etc.). Everywhere – Displays the ad everywhere in the country you’ve specified. By State/Province – Select a specific state or province in which to show the ad. By City - Select a specific city in which to display the ad. If targeting a specific city isn’t enough, then you can also list specific area codes to limit your ad’s appearances in the USA. For example, if you want the ad to appear only to people in downtown Los Angeles (and not the entire city of Los Angeles), then choose the area codes 323 and 213. 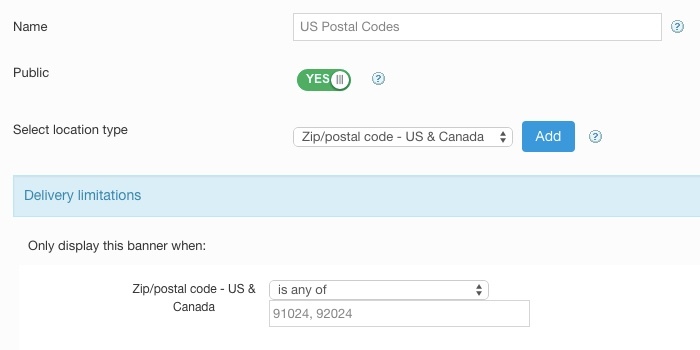 Locations can also be defined by specific zip codes in the USA or by postal codes in Canada. For example, zip code 92024 covers Encinitas, CA including all of its four cities. DMA is used to divide the United States into regions based on television and radio stations, as well as newspapers and Internet content. 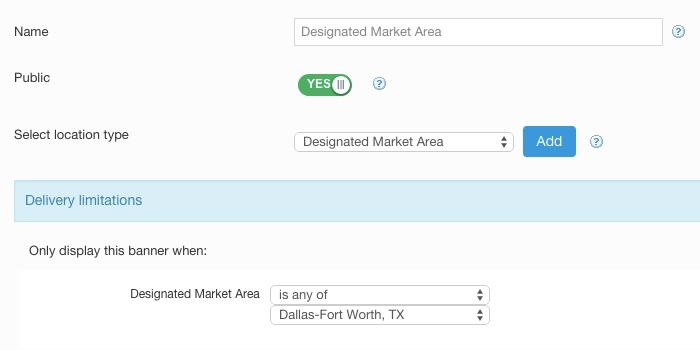 For example: Dallas-Fort Worth, TX is one of the Designated Market Areas. 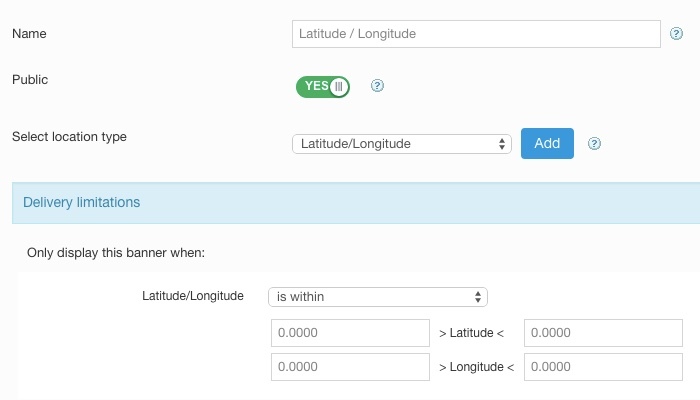 Each location has a latitude and longitude value and you can set the range of values for each ad. iJoomla Ad Agency’s Geo-Targeting feature is powerful, flexible and user-friendly. By creating a channel in the Geo Channels Manager. When the advertiser or admin adds a new ad or banner, they can now specify geo-targeted locations based on continent, country, state, city, zip code, etc. Each choice adds a new Geo Channel to the Channels Manager. The admin may also specify more complex Geo Channels on the Channels Manager. Each channel can use multiple terms, OR/AND conditions, and exclude as well as include specific terms. For example, you can create a channel for all countries except the United States, or all cities except Los Angeles. You can also combine more than one of these limitations with an OR/AND statement. For example, you can create a channel for Denmark OR Sweden. Turn Geo-Targeting On/Off — Uncheck both geo-targeting by banner/ad and geo-targeting by channel and your advertisers won't be able to restrict their ads by location. Restrict Geo-Targeting Terms – If you allow your advertisers to create their own Geo-Targeted channels, then you can also specify the terms they can use. We recommend letting advertisers use country, state and city, but you can also allow them to use other terms as well. Offer Your Own Geo-Targeting, Existing Channels or Both - Create your preferred Geo-Targeted channels on behalf of your advertisers. This leaves you in complete control. Geo-Targeting is simple for you and your advertisers. Our auto-fill technology for continents, countries, cities, area codes, and Designated Market Area fills in the information as soon as you or your advertiser begins typing the name of the target, and a selection of items will automatically appear. You can easily remove a term or add new ones. When you or your advertiser chooses an existing Geo-Targeted channel, the terms of the channel will appear and you'll be able to see all of the channel’s terms. To use the Geo-Targeting feature, you 'll need to upload a few files to your server using FTP. The files are too large to be included in the Ad Agency package, so you’ll need to manually upload them. Please note that we supply detailed instructions in the Geo-Targeting Settings Page to get you started! The free geographic database which we used for our Geo-Targeting data is pretty accurate. Countries and continents in particular are certainly safe. Other information may not be 100% accurate. We provide a Geo Module that you can display (make it “special” to display it for your eyes only) to show how the database reads your location. For example, it may show a city that is different from your actual city but which is nearby. We don’t think it’s a big problem for most advertisers, but it’s important that you know that this database isn't spot-on. If you prefer, you can purchase a more accurate database here. We also recommend that you re-download this database from time to time to make sure it’s up-to-date. Show Ads on Any Site! Ad Agency is fully integrated with JomSocial! The ultimate advertising extension for Joomla! iJoomla is not affiliated with or endorsed by the Joomla! Project or Open Source Matters. The Joomla! name and logo is used under a limited license granted by Open Source Matters, the trademark holder in the United States and other countries.